Invincible Defense Technology as a way to reduce social turmoil in Ukraine. Ukrainians continue to witness a highly volatile situation of turmoil unfolding in their country. Tensions continue rising as leaders search for ways to prevent insurgency from further escalating. What can be done to find a peaceful solution to this serious crisis? Many countries around the world have shown growing interest in a novel but scientifically verified, militarily field-tested approach to reducing turmoil. Among military circles worldwide, this approach is known as Invincible Defense Technology (IDT). Social turmoil such as conflict, war and terrorism is ultimately a human problem requiring a human solution. 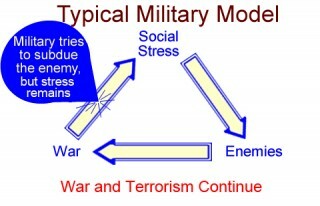 Experts in the field of conflict resolution maintain that the underlying cause of social turmoil is accumulated collective “social stress” – i.e., mounting political, religious and/or ethnic tensions between rival factions. As social stress builds collectively, divisions grow stronger, groups take sides, leaders are unable to resolve differences, and enemies arise within or outside the nation. Military and police forces may then be called upon to protect the nation, resulting in conflict, terrorism, and unpredictable outcomes. 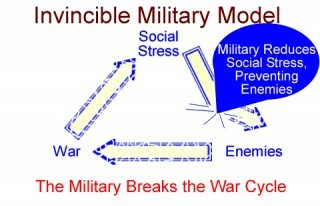 But even if military force temporarily solves the problem for the stronger side, the social stress remains, fueling future cycles of turmoil. In contrast, the absence of collective stress translates into the absence of tension between competing sides, thereby reducing the probability of hostilities. Today, the military of Ukraine has an opportunity to overcome the cycle of turmoil by deploying a scientifically validated technology of defense that neutralizes social stress. IDT is based on the unified field of all the laws of nature – the most fundamental and powerful level of nature’s functioning. For this reason, IDT supersedes all other known defense technologies (which are based on electronic, chemical, and/or nuclear forces). The technology accesses and enlivens the unified field through subjective technologies of consciousness, thereby creating a profound influence of coherence and harmony throughout society that results in measurable reductions of crime, terrorism, and war. The military that deploys this powerful, human-resource-based technology disallows negative trends and prevents enemies from arising, and as a result, it has no enemies. No enemies means no war, terrorism and no insurgency. The late Maharishi Mahesh Yogi revived systematic subjective technologies for experiencing the unified field, including the Transcendental Meditation program and its advanced techniques. These techniques have been successfully applied by members of many faiths to eliminate conflict. Militaries in Latin America and Asia, as well as in African countries like Mozambique, have already applied these non-lethal and non-destructive technologies to reduce collective societal stress and resulting conflict. Its methods have been proven and adopted as part of the training of America’s future commanders at Norwich University, a nationally respected and oldest military academy in the USA (see also the YouTube video “Meditation Improves Performance at Military University” and the Official Homepage of the US Army). IDT is further validated by 23 peer-reviewed studies carried out in both developed and developing nations. These studies confirm that when the required threshold of IDT experts is crossed – approximately the square root of 1% of a given population – crime goes down, quality of life indices go up, and war and terrorism abate. Scientists have named this phenomenon the Maharishi Effect, since Maharishi Mahesh Yogi first predicted it. The causal mechanism appears to be a field effect of consciousness – a spillover effect on the level of the unified field from the peace-creating group into the larger population. The likelihood that these combined results were due to chance is less than one part in 10 to the nineteenth (Journal of Social Behavior and Personality). More information is available in another follow-up study published in the Journal of Scientific Exploration. A global-scale study published in the Journal of Offender Rehabilitation documented a 72% drop in international terrorism during assemblies of sufficiently large peace-creating groups. The military of Ukraine is responsible for defending its citizens. As with other militaries, it can now succeed in its mission simply by creating a Prevention Wing – a group of IDT experts. The size of this Prevention Wing would be small – approximately the square root of 1% of the population of Ukraine. Only a small number of military personnel would be needed to staff this Prevention Wing. IDT could also be introduced into other large groups such as the police forces, or militias. As part of its responsibility to protect citizens, the military of Ukraine is obligated to thoroughly examine scientifically validated methods for preventing conflict, war and terrorism. With the IDT approach, all that is necessary is to provide the proper training for a group of military personnel – or indeed, any sizable group within the nation. The military of Ukraine has the opportunity today through IDT to prevent further turmoil and to create national security, invincibility, and peace. Extensive scientific research objectively says, “Yes, the system works.” Why not use it now? Time is running out. Share the post "Peaceful minds can reduce social turmoil in Ukraine"